Enktoeia milking one of her reindeer. She is head of a Tsaatan family, who live with their 30 reindeer near Khovsgol Lake. They made the decision to live in Khovsgol National Park, 300km from their homeland, to make an income from tourism. 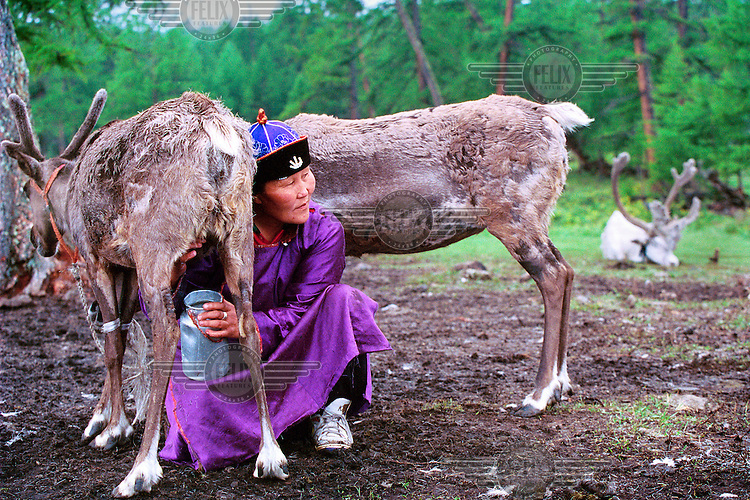 Mongolians and foreigners come to see the reindeer being milked and pose for pictures..The Tsaatan are a nomadic people from a remote area, Tsaagaan Nuur, near the border with Siberia. The community is diminishing, with only 30 families and 300 reindeer left. With the closure of the border between Mongolia and Siberia the nomadic life became more difficult.